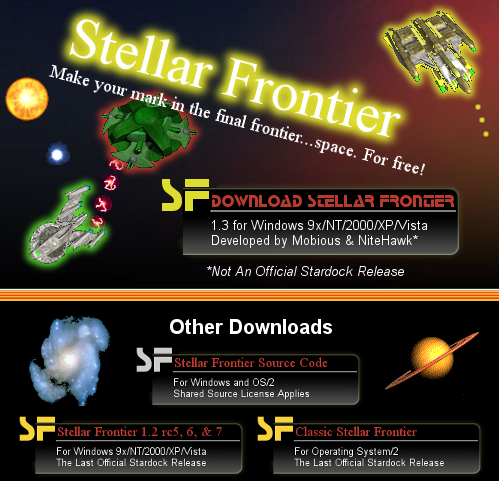 Stellar Frontier is freeware for the standard game. It is designed to be played exclusively on the Internet though players can practice against the computer players. - Pentium 233 or higher. - 36 megabytes of memory. - 28.8k modem Internet Connection. Please read the :::Newbie Guide::: before you start playing. SF Nexus Agent by plague - This is a working version of the 'Spy' program included in the standard Stellar Frontier game installation. It allows you to view which servers are up and see which players are in the servers, without needing to log in to the servers yourself. It works with the Stardock Nexus (which is now offline), the SFDC Nexus, and Skillet's Nexus. SF Editor by Jason Kane - Edits the Dat files in Stellar Frontier, allowing creation of a server to be much easier. SF Score by Jason Kane - This program allows server operators to generate ranking lists from their server.log (and .server-log) files. Lots of rankings are supported. Mod Library - These are various dat files created by SF players. Graphics Library - These are various graphics created by SF players and developers for public use.